History: With the galaxy-spawning Terran Empire well into decline, survival in the 26th century once again descended on the swiftness of a man's gun. Chaos reigned in solar systems that had reverted to barbarism, but one man stood for law and order. His name, Sol Rynn, known as Starhawk. He roamed the universe in his ship, the Space Rider, designed by Sol Rynn himself and allegedly the most advanced spacecraft ever built. His constant companion was the robot Droid, and his most insidious foe the alien Krell. 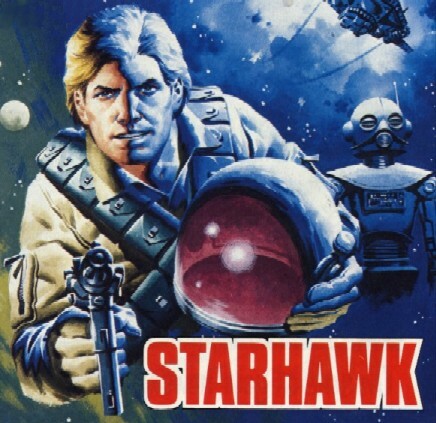 Comments: Starhawk was created by artist Ian Kennedy and writer David Taylor. 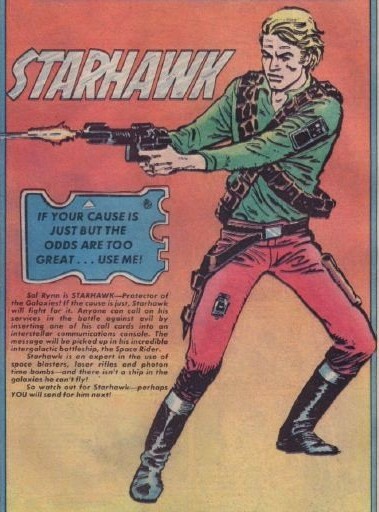 Starhawk survived Crunch's cancellation and merged with Hotspur, and later transferred to Buddy and then Spike, Victor and finally Starblazer.